Being healthy means more than just getting a good sweat. The holistic, longterm approach to health and wellness at Hyatt Training means we provide members with all the tools and education necessary to be their best selves. That includes having a great nutrition plan. The nutrition component of health can be challenging because it takes planning and time, two things our busy members sometimes have trouble carving out for themselves. 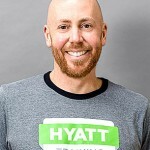 As a business owner, personal trainer, father and husband, check out how Hyatt Training owner Jeremy Hyatt keeps his nutrition on track. “Recently Hyatt Training began a relationship with Fit Kitchen Direct to help our members control some of the food decisions they make each week. I love eating well, but loath (truth) the massive Sunday prep sessions I used to tackle in order to have healthy lunches all week long. I eat Fit Kitchen for lunch five days a week. They have more than 100 menu items so I rarely see repeat meals and I really appreciate the variety each week. I used to make a big batch of the same meal and eat it all week! Admittedly, I am not a “leftovers” guy. My biggest concern was eating a warmed up lunch out of a plastic container. This has been an absolute non-issue. The meals taste fresh, the vegetables have great texture and the experience has been much better than I expected. And, the containers are recycled / recyclable. You can have the meals delivered to your house on Sundays for a small charge or have them delivered to Hyatt Training free to be picked up Monday morning (when you work out!). There are 3 options for meals: Protein (meat), Extra Protein (more meat), Vegan and Whole 30. They also offer protein bars and single chicken breasts. All meals are roughly 500 calories and a 40% carb / 30% protein / 30% fat split. This controls calories but also offers the gold standard macronutrient split for most diets. The meals are also free of gluten, dairy and refined sugar (yes, all of them!) There are more than 100 menu items. It’s important to start with the basics and move from there. Too often, people get into complicated movements and goals before they have the proper fundamentals, which can lead to negative results. My number one job is to get my clients stronger for the things they want and need to do. 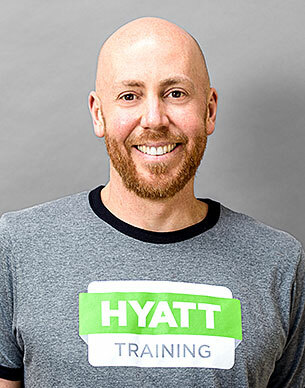 Hyatt Training is a collective of certified, enthusiastic and innovative independent personal trainers in Portland, Oregon. To learn more about our personal trainers or to set up a free consultation to see how they could help you, email us at Go@HyattTraining.com.